A potentially quiet silly season for coaching moves can quickly turn into whirlwind of big openings. That was the case last year when Nebraska and Florida descended into tumultuous seasons and fired third-year coaches who had winning records in 2016. Multimillion dollars buyouts be damned. The reality is most FBS coaches are one truly terrible season away from being fired. Now more than ever changes throughout an administration can trickle down to the coach’s office and be the catalyst for change. That’s why Bobby Petrino enters an interesting season at Louisville. Not only has Lamar Jackson moved on to the NFL, but the basketball-related scandals at Louisville have led to a new athletic director and university president. Could Petrino decide it’s time to move on as well? The 2018 hot-seat watch has already taken a bizarre turn at Ohio State. If that job comes open, it could trigger a chain reaction across the country. For now though it’s hard to find even six coaches who are clearly in trouble, but there are a few who could really use a better record this year than last to avoid giving their bosses something to think about in November. Beaty was practically set up to the fail in his first head coaching job. 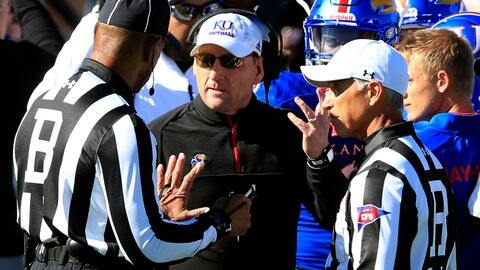 The Jayhawks‘ roster had been left woefully depleted by Charlie Weis and KU was looking for someone to clean up the mess on the relative cheap. Still, three wins in three seasons means trouble for the coach. And now there is a new athletic director at Kansas in Jeff Long. Beaty knows the deal. The Jayhawks need to show real progress in year four, but it seems like a stretch to project more than a couple victories. The next coach is likely to benefit from Beaty’s cleanup. It was just a few years ago Fedora seemed on the rise, rumored to be in the mix for other openings. Now after 3-9 last year and looking at starting this season navigating the suspensions of 13 players through the first four games, he is not so comfortable. A solid season should be enough for Fedora to stabilize his status, but another washout would test patience at a basketball school that usually has a lot. Kingsbury has been treading water at his alma mater, with an administration that wants him to be successful and a fan base that seems to cut him some extra slack. The Red Raiders are finally starting to play a little defense, but they have quarterback questions this year. Firing Kingsbury, who is 16-29 in the Big 12, won’t be too costly, about $4 million. The key question: What happens if the Red Raiders have another so-so season? Because that seems to be the most likely result. Two years removed from being national coach of the year, MacIntyre and the Buffaloes are again in need of a course correction after 5-7 in 2017. Fortunately for him, one year into a five-year, $16.25 million contract, the bar probably won’t be too high this season. He was also reprimanded and fined by the university after last season for his handling of domestic violence allegation against a now former assistant, so maybe that lifts the bar a little. Another bowl-less season for proud program could spell the end for Montgomery, a promising young coach with a good resume. East Carolina is also in transition at athletic director, which injects uncertainty into the situation. Even a modest step forward for the Pirates this season could be enough. The promising news is East Carolina could be sneaky good in the American Athletic Conference, and both of its Atlantic Coast Conference opponents— North Carolina and Virginia Tech — look vulnerable. That Smith makes the list is a testament to how few coaches enter the season in really precarious positions. The Illini would be on the hook for about $12 million to let the 60-year-old former NFL coach go. Plus, AD Josh Whitman has a lot of credibility invested in his splashy hire. The Illini enter the season on a 10-game losing streak, but were stunningly inexperienced last year. Sixteen true freshmen combined to make made a total of 87 starts. They almost have to be better.